Over the last few days we have been seeing a few unusual humminbirds in our garden (just south of Mariato, on the western side of the Azuero Peninsula). Today I finally managed a (not very good) picture of one of them. 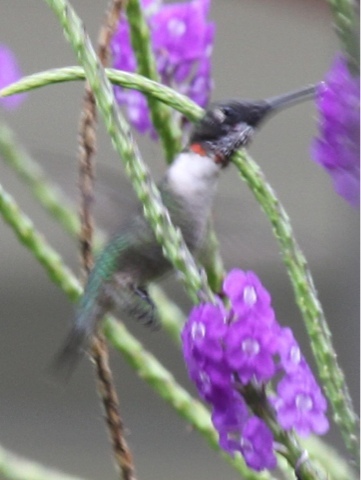 And managed to identify it as a Ruby-throated Hummingbird. Even on this picture you can see the beginnings of the ruby throat. So this is a first year male. There is another individual of the same species with a more developed ruby throat. [Ruby-throated Hummingbird is a regular winter resident in western Chiriquí, with a few records from southern Coclé. This may be the first record from Veraguas].